Alumnus Joe Ziegler paints a picture of present-day UCCS. If you walk past the SLL office in the next week, you will notice a man with an unfinished canvas. Joe Ziegler, a UCCS alumnus, wants to give back to his alma mater through his art. Ziegler is creating three paintings of the campus: as it was then, as it is now and as it will be. “The first image I painted is a black-and-white rendering of the campus in 1965, so as it was when they first opened the school,” he said. The second painting will showcase present-day UCCS. “The third one will sort of pay homage to hope for the next 50 years,” he said. Ziegler graduated from UCCS in 2007 with a communication degree, but has practiced art as a hobby since he was in high school. “I never really actualized (art) as my work or my career endeavors until much more recently,” he said. 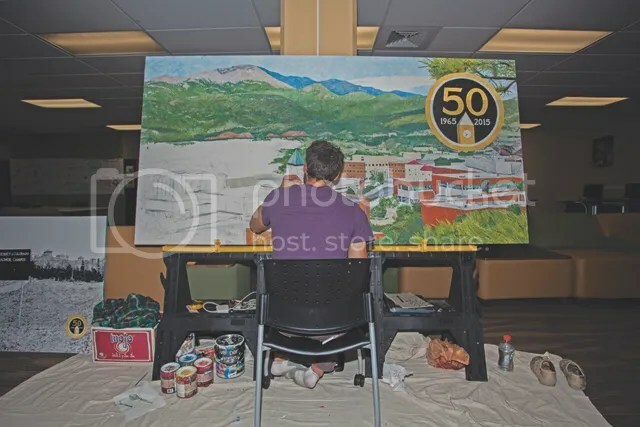 He decided to create the paintings of the campus to give to the school for its 50th anniversary. “I’ve wanted to give back to the school in whatever way I could. Being a starving artist makes it difficult to give back financially,” Ziegler said. He brought up the idea of the paintings to Chancellor Pamela Shockley-Zalabak. “(I) said that it would be fun to do and she said they were actually kind of looking for an artist and she was excited the fact me being an alumni, so there was that connection as well, it wasn’t just somebody that they found to do it,” Ziegler said. “I’m really happy about being able to work with the school on it,” he said. The paintings are made with acrylic paint, in the style of pointillism, which Ziegler said was popularized in the late 1880s by the French Impressionist painter, Georges Seurat. “I’ve always resonated with it. I like the idea of being able to create art that is made one dot at a time, you know, it’s a connection with absolutely every square inch on the canvas,” Ziegler said. He said he is donating half of his work, and is being commissioned for the other half. Ziegler said he hopes to have the paintings finished by Oct. 31. Students interested in seeing more of Ziegler’s art, including his exhibit, Black Faces of Rock, can check out his Facebook at www.facebook.com/joezieglerart.